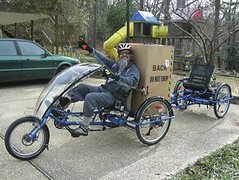 I use my trike (and another recumbent bike) as my primary transport. The trike is my utility vehicle that I use for hauling groceries, 5 gallon water containers--and even a fridge (see photo). It has 192 speeds so it can haul any weight up any hill with ease. Once one gets use to biking/triking for their transportation needs, cars look silly for general transportation needs. A 15-mile radius around your house can be done easily and a 30-mile radius if time permits (time, more than energy, being the issue.) I have biked in all weather conditions, but most of the time extremes can be worked around.